WISH LESS gallery is pleased to announce Steff Plaetz’s solo exhibition. Steff is a British artist whose work is highly regarded across the world. He has work in the collections of Ian Brown and Michael Stipe(R.E.M) and other noted musicians. In this exhibition, we will exhibit Steff Plaetz’s new work and some pieces from his recent collaboration with Will Barras. For the opening reception, special guest DJ will be Joe 2 Grand (RPM/Runaways UK). Steff Plaetz began painting in Bristol in the mid ‘90s, developing a loose and spontaneous style incorporating a uniquely ‘freehand’ stencilling approach based on ‘automatic’ drawings and sketches which retain their rawness through to the final artwork. He was along with his friends Will Barras and Mr Jago one of the original 3 core members of the hugely influential ‘Scrawl Collective’. Inspired as much by his globally nomadic lifestyle as his soft spot for quality sci-fi, that was inevitably nurtured by being a kid growing up through the ’80s, Steff collides ideas of bleak futro-industrial landscapes with dream-like snapshots of urban activity. His infinitely sustainable resource of imagination runs as wild as the acrylics and spray paints that colour his works. 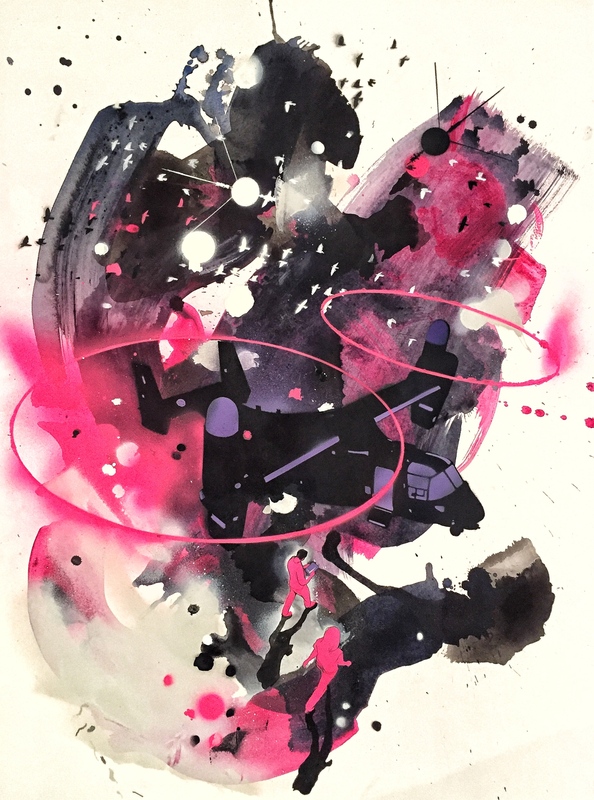 Alongside working as an illustrator, Steff has exhibited his works internationally in Tokyo, New York, Osaka, Paris, Hong Kong, Brussels, Barcelona, Cologne and of course his home London, and has been commissioned and collected by Ian Brown, Michael Stipe and David Holmes amongst others.